Ted Barrons standing on the threshing machine on left. He was the brother of George Barrons and moved to Saskatchewan in 1905. Many settlers raised cattle and pigs; the cattle mainly for the milk and the pigs for their pork. Pork was preserved in a barrel with lots of salt. When it was cooked, it was put in an iron kettle and slowly boiled to remove the salt. After it had boiled for a length of time, the salty water was removed and the pork covered with pure water once again, and allowed to finish cooking. Settlers grew their own vegetables. They were stored in a shallow hole in the ground, covered with straw and dirt for later use, and to provide seed for next year. Some built root cellars of log or stone. All work, from clearing the land to harvesting, was done by hand. The hay was cut with a scythe and raked by hand. The grain was sowed by hand and sometimes covered with a drag made of brush. When the grain ripened, it was cut with a cradle, hand raked into sheaves and tied with a band made of the grain stalks, and stacked. 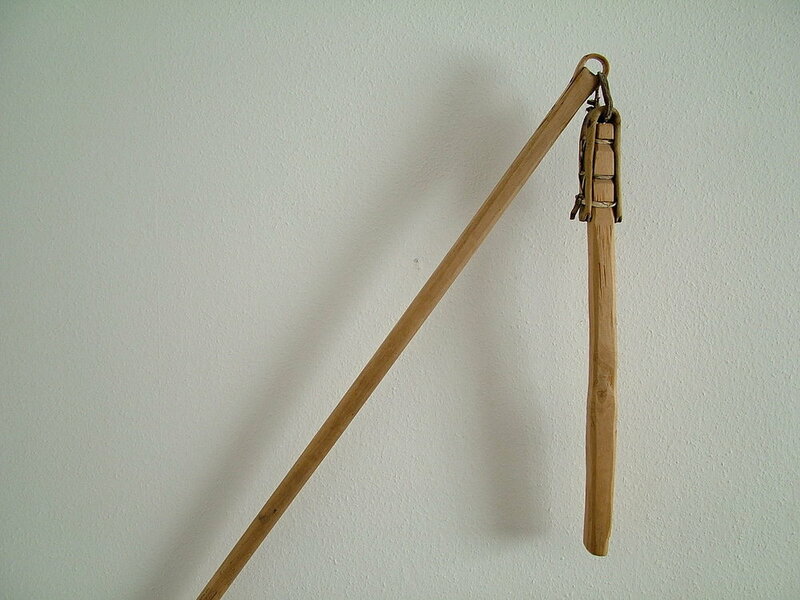 It was then taken to the barn and thrashed with a flail. This knocked the kernels of grain off the stalks. The wind would then separate the grain by blowing away the chaff. The invention of the threshing machine made harvesting of grain considerable easier. It was powered with horses on what was called a "horse power" with horses going around on long arms to turn the capsule, which went to the machine with tumbling roads. Usually four teams of horses were on it. The sheaves of grain were fed into the open cylinder by hand after the bands had been cut . The threshing machine separated the grain from the straw (which was usually stacked and used later as bedding for the farm animals). Next came the steam engine which provided power for the threshing machines. The engine was moved by horses from one job to another. Water had to be drawn using teams hooked to a wagon. Then came the more modern steam engine which moved under its own power. The threshing machine had a self feeder and a blower. This was followed up by a tractor for power. The most modern machine was the combine, some pulled by tractors, others self propelled. This meant that the sheaves of grain no longer had to be drawn to the barn to be harvested. It was, instead, harvested in the field where it grew. The kernels of grain were collected in a bin, which was periodically emptied into a tank, taken to the storage area and unloaded. Ronald Barrons : Threshing time was a great time when we would move from farm to farm. It allowed that we might know our neighbours in a working environment and appreciate them in ways that differed completely with chance meetings on other occasions. With those from Vansickle, who came to our community, this was especially enjoyable. And in return, I got to see their farms, that I would not otherwise see. Mostly, my job was carrying the grain from the machine to the grainery (32 pounds per bushel) and might total four or five hundred bushels or more a day. It also involved the eating of a lot of dust thrown out by the thresher. Anyways, memories I cherish. Chris McKee I remember going to farms with Charlie to thresh grain. he would hook up "big Bertha" his Case L to his thresher and a way we would go with me sitting on the fender. 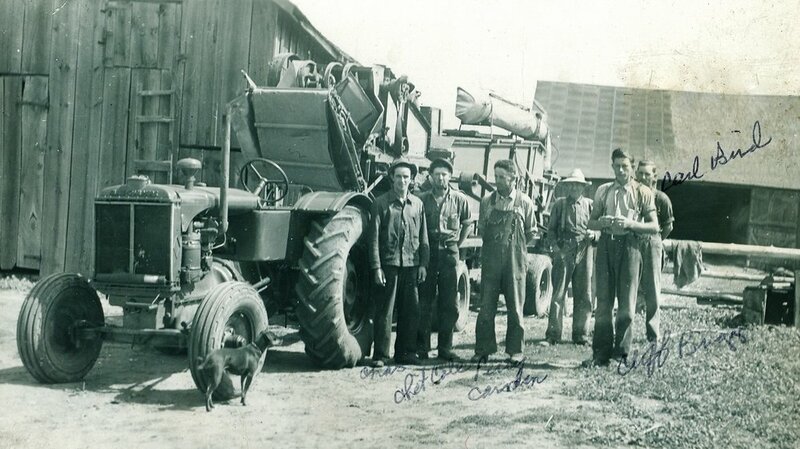 The man on the left is Charlie Campion, my grandfather, wonder if that is his thresher as he did custom threshing for folks. John Reynolds On my grandparents farm I was pretty small at the time. I remember stooking sheaves in the field. When the threshing gang arrived the meals seemed like a feast every day. When they were finished we would all head to the neighbours and do their crop. Fond memories, but hard work.